The fourth India-Africa Forum Summit is underway in New Delhi this week. 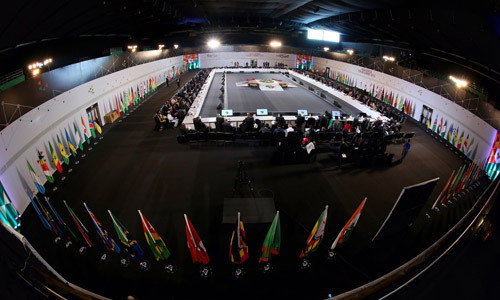 Leaders of 54 African countries and Unions are participating in the event. In a conversation with African journalists before the summit, Indian Prime Minister Narendra Modi had indicated that India and Africa could build a mutually beneficial partnership in a number of areas. "We will work together to address the problem of climate change. We will explore new areas like a sustainable blue economy. Our initiatives will aim to use the power of science and technology, space science and the networked world to transform lives," he had said. It is believed that Modi is likely to announce a global alliance of almost 110 countries to encourage implementation of solar power to address energy as well as climate change issues. This global alliance will reportedly be called the International Agency for Solar Power and Application and is expected to bring in business worth US $100 billion by 2020. It is also anticipated that a special fund will be declared for the alliance. The alliance is a commitment made by India as part of its climate action plan for 2030 to the United Nations Framework Convention on Climate Change (UNFCCC). Susheel Kumar of the Ministry of External Affairs and head of the delegation to the UNFCCC had spoken on similar lines at a conference organised by Delhi-based non-profit Centre for Science and Environment in June this year. "All the countries that lie between the two tropics of Cancer and Capricorn have so much potential for solar power that countries from Africa, Asia and Latin America should form a coalition to support development of renewable energy in these regions," Kumar had said. Recently, politicians from 14 African nations together with former United Nations Secretary-General Kofi Annan, Virgin head Richard Branson and other business leaders launched a global campaign to bring solar power to millions of people across the African continent who still have little or no access to electricity. Modi has found support from China, Australia, Brazil, New Zealand and African countries for this alliance. With a decline in the cost of generation of solar power and a surge in the availability of cheap Chinese panels in the market, solar power has now become a more attractive investment. India will most likely provide a platform to the countries to share their knowledge and other related resources.